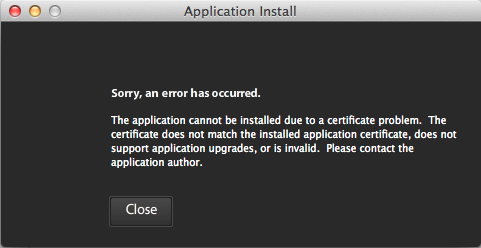 I'm receiving an installation error message regarding a certificate problem (see attached) )when trying to update the desktop version of Goalscape from v2.8.3 to v2.9.5. I'm running Mac OS X 10.9.5 and the latest version of Adobe Air (v28.0.0.127). How can I stop the upgrade message/check if my system doesn't support v2.9.5? How can I download the latest standalone version of Goalscape desktop? I currently have version 2.7.6. Goalscape Desktop is fully certificated (and always has been). The error message you are seeing is incorrect and misleading: the fact that it is appearing means that there is most likely an issue with your local Adobe AIR installation. The solution is to do the 'uninstall and reinstall Goalscape Desktop and Adobe AIR' fix – step-by-step instructions are on our Known Issues page. If that does not work for you, it is because the Registry information from an old installation is interfering with the new one, so you will need to clear your Registry. Full instructions for doing this are on our Knowledge Base here. Note that because you missed the intermediate updates that resolved the Registry issues, you may need to clear the Registry from both locations (ie under /Application Support for 2.8.3 and under /Application Support/Adobe/AIR/ELS for 2.7.6). If problems persist please post again. Thanks Richard. Reinstallation worked. FYI, I had just completed a clean install of Mavericks, so there was no prior installation interfering. Also, the Adobe link in the reinstall procedure was what I had also used on the first attempt…same version of Air, 28.0. 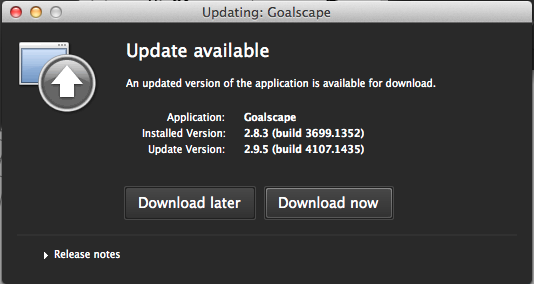 Since the link in the reinstall procedure was to the latest version of Goalscape Desktop, 2.9.5, it circumvented the need to go through the same update procedure that I was hung up with initially, moving from v2.8.3 to v2.9.5. So, not clear that there still isn’t an update issue. Splendid – thanks for letting us know. Thanks too for the additional background. Richard Parslow closed this discussion on 31 Jan, 2018 12:20 AM.